Leading construction materials supplier, Aggregate Industries has proven its unrivalled credentials once again in its recent work at the ground-breaking Woodsmith Mine development in North Yorkshire. 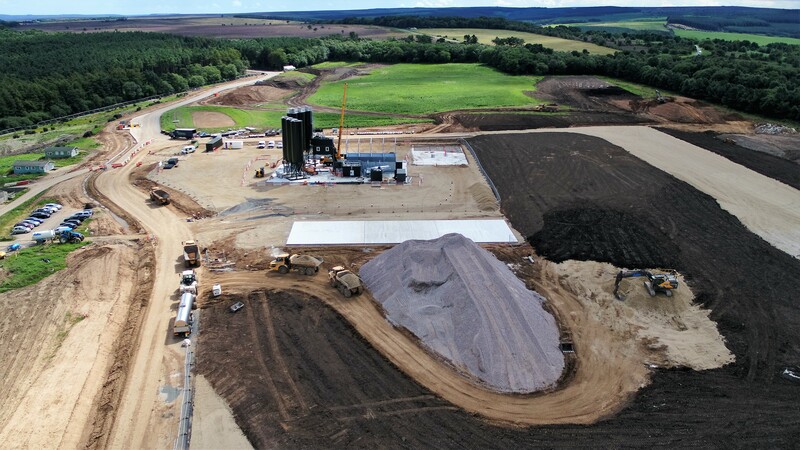 In November 2016, leading fertiliser producer, Sirius Minerals, announced plans to press ahead with a funding deal to start the construction of a massive potash mine in North Yorkshire, since named Woodsmith Mine. The £2bn development, which is now well underway, will constitute one of Britain’s biggest mines; to incorporate a vast mine head at Woodsmith Mine,, Sneaton, with shafts 4,921ft (1,500m) deep, and a 23-mile underground tunnel to transport the potash to Wilton International near Redcar. Core to the state-of-the-art project is the supply and delivery of a vast high quality, hardstone aggregate to be used for road construction and ground stabilisation works. Subsequently, leading earthworks contractor, Collins Earthworks called on the services of expert Aggregate Industries to provide the vast material requirement. During the course of just seven months, running from May to December 2017, Aggregate Industries’ specialist team has since supplied 81,000 tonnes of Type 3 sub-base aggregates and 9,000 tonnes of Type 1 sub-base aggregates, constituting a total of 90,000 tonnes. A further 20,000 tonnes of material was provided during January and February 2018. In order to effectively and sustainably manage the scale of supply demands, material has been sourced from the business’ Glensanda quarry and shipped to the nearby Teesside port, before being road hauled direct to the project. This approach has enabled the team to deliver in excess of 500 tonnes per day, while operating a stringent quality procedure to ensure the material exceeded the structure and strength values required for the project. 81,000 tonnes of Type 3 sub-base and 9,000 tonnes of Type 1 sub-base aggregates. Followed by a further 20,000 tonnes of material. I would like pass on my thanks to Aggregate Industries for providing such a swift and efficient approach to our aggregate requirement which has been vital to keeping the project on schedule. Working on a project of this calibre and scale, it is vital to partner with genuine experts with not just the product capabilities but the expertise behind it, and the team haven’t failed to deliver. I’m sure this relationship will continue as we progress the project over the next four years.